Click on photo above to return to product page. There was a feel of history about the old, shuttered factory on Chucktonunda Creek in the Mohawk River Valley in upstate New York. It had been closed down at least twice: first the carpet mill business went south. (The hydro-power from the creek could not compete with the cheap labor down there.) Then the promotions company moved up to more modern facilities. We entered the gray stone dim cavern of the warehouse bays to be overwhelmed. The patriarch of the promotions business died with an estate full of artifacts from a life lived very large. Massive dark wood furniture, china sets actually from China, and momentous, aged sculptures of the three wise men from a nativity scene that probably stood in the front garden of his mansion. Up a cold cement ramp with black tire marks from the squealing wheels of a forklift carrying too much paper scrap. Up a clangy flight of steel treaded steps, we summited into the patriarch’s office quarters and into a warm, elegant world . . . full of art. Before we walked away from these works safely on their way to good homes, we took one more scout around to make sure there was no art calling out to be saved in a quieter voice. And, in a pile on the back floor near a cement block wall, lost in the papered-wall din, we saw them and heard them speak. 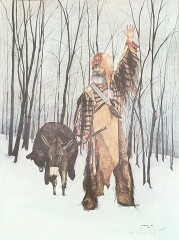 Five pencil-signed, limited edition prints by upstate New York artist Ken Schmidt, whose watercolors of mountain men and Native Americans have been shown all over the world. On our way down the clangy steps and through the cold caverns, I asked Valerie: “How many of the rescued prints portray Native Americans?” She quickly replied: “Three.” Actually there was only one Native among the five. The rest were mountain men. Valerie’s first impression had revealed a true genius of Schmidt. In a very beautiful way, he showed us the interplay and inter-acceptance of whites and natives in the days before native ways were stunted during the American Indian Wars. These rescued prints depict both Native Americans and mountain men in the same clothing: tasseled animal skin cloaks, blanket jackets, beaded moccasins and feather adornments. They also had long hair with beads braided in. Even more poignant, they share the heroic bodily attitude of the tracker, the far gaze of one looking for game and danger, and the rugged look of men unsheltered for long periods of time. If it were not for the Euro-talent of growing beards, Schmidt’s men from two worlds would be very difficult to differentiate. In painting the characters from this frontier era of merging and mutual respect, Ken Schmidt has done us an important favor. He reminds us that business patriarch and forklift driver, fancy sculpture and ignored print, mountain and Native men can come together in beauty.